Gavin Newsom (D) leads with 23.9% and Travis Allen (R) is the highest vote-share GOP candidate at 11.8%. John Cox (R) is at 11.2% and Antonio Villaraigosa (D) at 13.5%. John Chiang (D) sat at 8.9% and Delaine Eastin (D) at 4.9%. “Lopsided voter enthusiasm, a divisive sanctuary state law and concern over pocketbook issues are fueling a surprisingly close gubernatorial primary in The Golden State. Gavin Newsom leads the pack, but his lead is soft and three candidates are in a statistical tie for second place,” Big Data Poll Director Richard Baris said. Please email the director with media inquiries and questions at director@bigdatapoll.com. 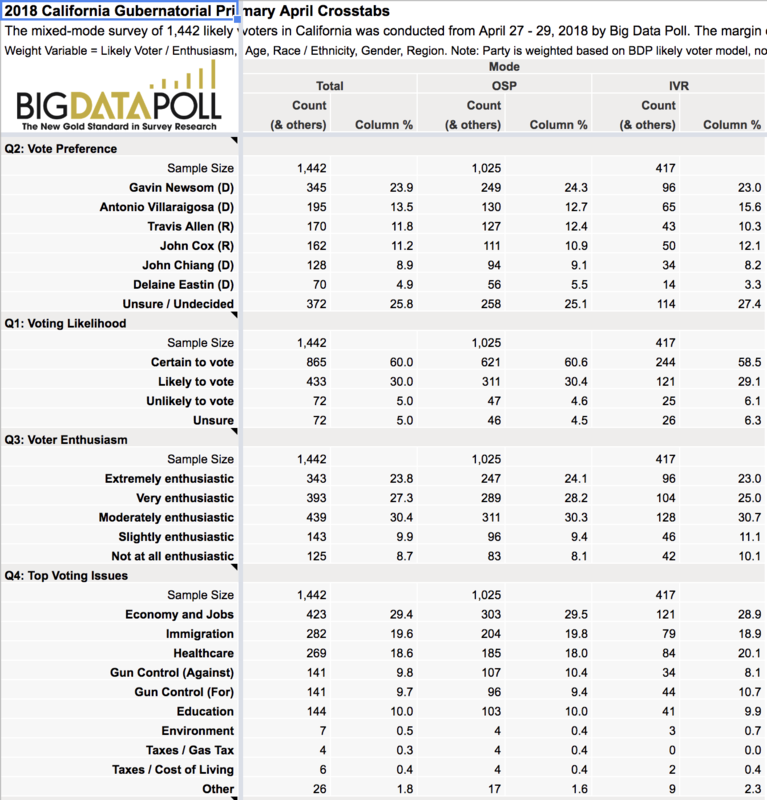 The mixed-mode survey of 1,442 likely voters in California was conducted from April 27 – 29, 2018 by Big Data Poll. The margin of sampling error = +/- 3% with a 95% Confidence Level. Row % calculated only on the inner-most nested variable. The poll was conducted for Travis Allen for Governor 2018.